Public lands ranchers in the Argenta allotment have long resisted BLM controls on livestock grazing. They were emboldened by the Cliven Bundy debacle, and BLM’s continued failure to effectively deal with Bundy. Argenta ranchers even deny a drought has been taking place. A “Grass Camp” was set up across from the BLM of fice, to intimidate BLM and keep the agency from protecting public lands during drought. Fragile sage-grouse and other wildlife habitats are being destroyed by severe grazing and trampling. The sage-grouse season has been closed due to population declines. Even dead wildlife get trampled to oblivion by the grossly overstocked herds. in 2015, political meddling imposed a special BLM-Forest Service and cattle industry consultant “Team” on the allotment. The “Team’ orchestrated a settlement of Appeals. The settlement stripped rancher accountability. It set up a secretive closed door group that has taken over management from BLM. The group is laden with ranchers, cattle consultants and a token enviro rep. Decisions are made in closed door sessions, violating the public’s First Amendment rights to access and observe government activities. A cow consultant “Stockmanship Plan” relies on inflciting severe trampling damage, which dries out and kills surface water flows and causes cheatgrass and other weeds to proliferate in sage habitats. WLD site visits in 2015 found devastated springs and uplands. Even some of the utilization cages that are supposed to gaug e the level of use by providing ungrazed reference areas were destroyed. 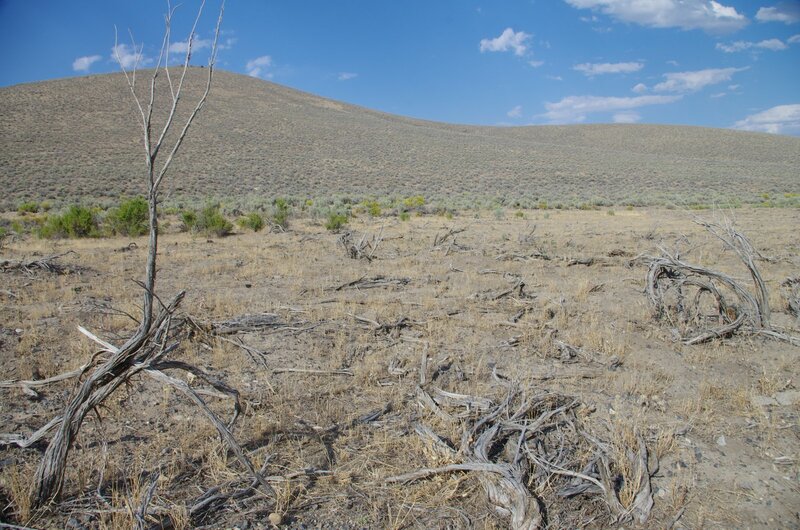 Uplands are choked with weeds, and the sagebrush cannot regrow under the severe grazing abuse. ve Appealed a recent BLM Decision to piecemeal in the first of a long series of cattle fencing projects the welfare ranchers have been clamoring for – rather than working to control their livestock. The fencing is an effort to cover over the most prominent damaged areas and monitoring sites, while a full bore gazing assault continues everywhere else across the allotment. Nevada BLM has a pattern of trying to bar public access and observation to activities that may be controversial, or where special deals for the livestock industry are going down. WHE’s Laura Leigh has had to fight long and hard to gain access to observe BLM wild horse round ups in Nevada. Yet now BLM is repeating the same cover ups in Argenta. The situation exposes the inability of BLM under Director Neil Kornze, an Elko native, to be able to effectively deal with livestock grazing on public lands sage-grouse habitat. Instead, BLM’s strategy appears to be to give the livestock industry free rein to wipe out the birds by de vastating their habitat. Current Nevada BLM Director Ruhs is aiding this effort.